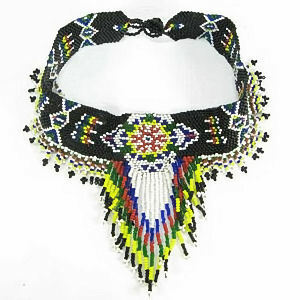 This beautifully hand beaded choker necklace is made with hundreds of tiny size 11/0 Cz seed beads in a traditional Sunburst pattern. It has red, white, hunter green, and yellow beads on a black background. The Sun symbol represents life, power, strength, energy, clarity, and Self. This Sunburst hand beaded choker necklace measures 4 inches (10.2 cm) from the top of the choker band to the bottom of the drops. The choker band is 1 1/8" (3.8 cm) wide and the length is adjustible from 13.5 to 14.5 inches. (34.3 cm cmto 36.8 cm). 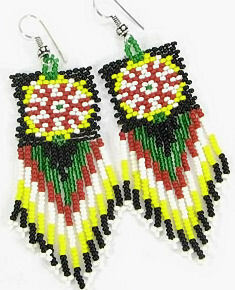 Matching beaded earrings are included. The earrings are 1" wide (2.5 cm) by 2.75" long ( 7 cm), not counting the hypo-allergenic french ear wires. 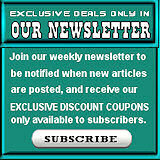 This product was added to our catalog on 06/13/2010.